We offer the highest quality and widest selection of stock and fine art photographs of water drops and splashes. We also have milk drops and splashes. We can create custom images on assignment for advertising, branding, and coporate identity. We also sell high-resolution fine art prints. See our gallery. Martin Waugh's Liquid Sculpture images are water art photographs of fascinating liquid shapes that were created by dropping and splashing water, or other liquids. These sculptures are then photographed using high-speed photography, since they last only a few thousandths of a second. Some of the pictures are amazing, others relaxing. Creating and capturing these amazing photos requires careful manipulation of the materials and precise control of the lighting and timing. Water photography, and other liquid pictures captures the sensuous shapes of flowing fluids. There is something universally appealing about the art of liquids flowing, running, or splashing. They are beautiful, restful, and evocative. At times, they seem like old friends you've never met. 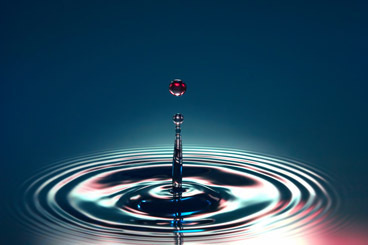 A simple water droplet is beautiful, but when two drops collide, the varieties are endless and fascinating. The shapes are affected by many things: the physical properties of the liquid, such as surface tension and viscosity, as well as the timing of the drops and when the camera's shutter is opened and flash fired. Being experiments in fluid dynamics, they reveal the chaotic nature of fluid flow - it can be quite reproducible sometimes, and other times highly sensitive to initial conditions. 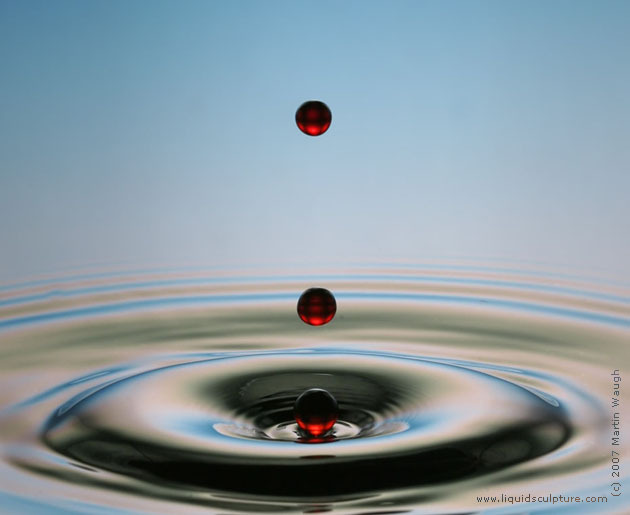 Places to learn more about water drops: Wikipedia discusses some about the surface tension of water and how it helps form drops. The hydrodynamics of water drops are complex, and ever-fascinating for physicists. A very clever device created a hundred years ago by Lord Kelvin uses water drops to create static electricity . 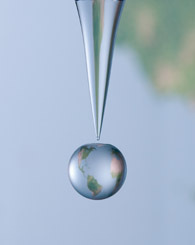 Of course, NASA can't resist experimenting with water drops in zero-gravity . An interesting result recently showed up: if there isn't any atmosphere, water drops don't splash on a dry surface. Wendy W. Zhang from the University of Chicago presented an illuminating paper on capturing liquid motion and water drops in Boulder in 2006. Droplets of milk make fascinating splashes. It was one of Harold Edgerton's lifelong pursuits to capture "the perfect" milk splash. His image of a drop of milk splashing on a red background is one of the best-known high-speed photographs. We can create custom images on assignment for advertising, branding, and coporate identity. 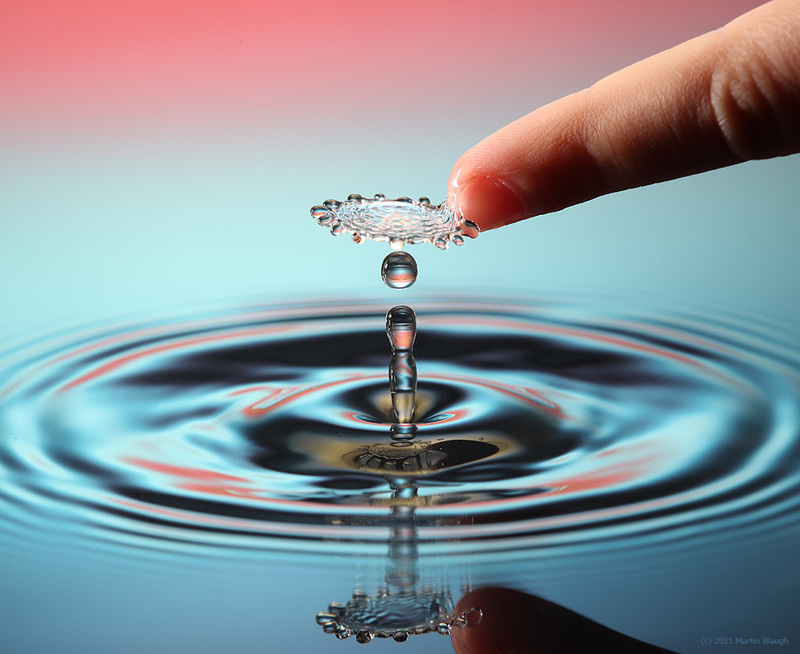 We offer the highest quality and widest selection of stock and fine art photographs of water drops and splashes. We also have milk drops and splashes. We also sell high-resolution fine art prints.